Are you looking for bathroom countertop ideas for your Maryland, DC, Northern Virginia, Baltimore, or Arlington bathroom remodel? At Express we only deal with countertops, which means we spend a lot of time coming up with unique ideas to help our customers make their new countertops truly their own. Keep reading to learn some of our top bathroom countertop ideas to make your countertop purchase extraordinary. If you’d like to speak with a countertop expert who can answer all of your questions, call 410-712-0601. 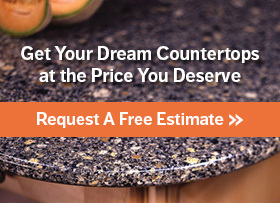 Or click here to receive a free bathroom countertop cost estimate. When it comes to bathroom countertops, we encourage you to let the ideas flow. Materials like glass and cultured marble that wouldn’t work as a kitchen countertop can transform your bathroom’s appearance into something more elegant and modern. Adding a natural stone or brightly colored bathroom countertop can alter the mood of your bathroom. Consider whether you want your bathroom to be relaxing, energizing, classic, modern, etc., and then find a counter that encourages that mood. A great way to make your new counters really contribute to the mood of the room is to install a matching tub deck. Countertops (especially naturally stone) are one of the most unique and beautiful surfaces in your home. Instead of buying bathroom countertops to match your bathroom, why not make them the focal point? When your bathroom is small, the last thing you want is to install a countertop that dominates what little space you have. If you are going to have a countertop in your bathroom, you want it to be functional and minimal. For these situations, we want to share some of our favorite small bathroom ideas. Want to Discover Even More Ideas? If you want to learn some more of our secrets that we’ve learned by installing countless countertops in Maryland, DC, and Virginia homes, then contact us today. We’ll be happy to come to your home and truly assess which ideas will work best with your bathroom. We have some secrets that we’re holding back (from our competitors, not you!) that can make your bathroom countertop truly impressive while remaining affordable. Want to read our ultimate guide to bathroom countertop materials? If you’re ready to discuss bathroom countertop ideas with us, call 410-712-0601 to speak with our design experts. Or click here for your fast, free estimate. Express Countertops is home of the famous 1 Week Installation Guarantee! When it comes to bathroom countertops, we don’t even need that long. Contact us today, and we’ll be happy to set up a free, unforgettable shop-at-home experience to discuss your bathroom countertop options.